Today's custom wallpaper inspiration source is your trusty old passport. Whether you've been to our neighbors Canada or Mexico, or all the way around the world, your passport tells the story of your travels through official stamps that more often than not include the date of your passage. 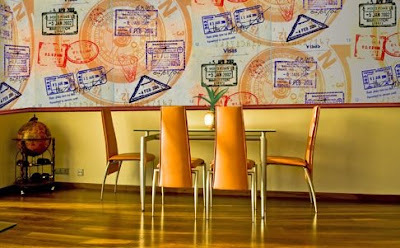 Why not commemorate your travels with a custom wall mural based on an image of your passport? Different countries of course have different styles of passports. The passport shown in the inspiration room's wall mural is from France. Loosely collaged pages from the passport create a unique and random pattern of stamps and scribbles. The cool oranges in the wall mural mesh well with the room's decor, the slight busyness of the mural tempered by a more reserved room layout overall. The US passport is quite interesting as well, in blues augmented with reds and purples. Of course, the more stamps the better to flesh out your custom wallpaper design, but don't worry if your passport is a little thin; we can digitally add in stamps from other countries to help flesh out the look. Adding in additional items to the custom wall mural is encouraged as well: photos, souvenirs and trinkets that remind you of your past travels could be layered into the wallpaper easily.